Police are cracking down on crime on Miami Beach as Spring Break is well underway. NBC6 Reporter Laura Rodriguez explains. Spring Break crowds are keeping officers on Miami Beach very busy. 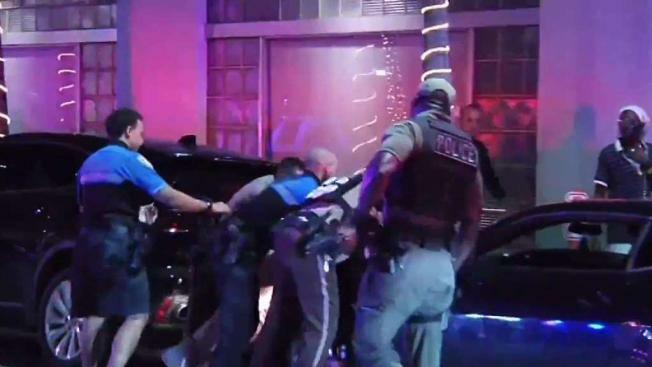 Miami Beach police said a man yelling profanities was escorted out of Cameo Nightclub on Saturday for an altercation that happened inside. “it was an altercation between a man and a girl. Somebody got knocked out,” said Hakim Ali, a witness. Officers tried to defuse the argument between the man and club staff. But according to police, Freddie Jenkins began to yell at the officers and the situation escalated. “It’s a bad situation,” said Ali. “Too much liquor. Everyone has to control their liquor. Police arrested Jenkins for disorderly intoxication and resisting an officer without violence. The arrest came as a new policing strategy kicked off this weekend. On Saturday at around midnight, a stabbing took place near 15th Street and Collins Avenue. Police are looking for a man and woman who fled the area. On Friday afternoon, officers arrested Garrett Thomas Flores after he allegedly ran over an officer with his motorcycle. Police said they don’t want to deter anyone from coming to the beach. Most spring breakers say they are okay with the increased security. “I’ve been here the past couple years for Spring Break and it seems a lot more under control than it usually is,” said one tourist.